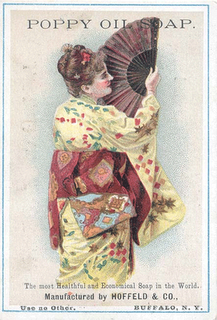 from the ephemera society, "With the opening of Japan to trade in 1854, the American market was flooded with goods from the Far East. Later on, exhibits of Japanese goods at the Centennial Exhibition in 1876 in Philadelphia and the success of Gilbert and Sullivan’s operetta The Mikado as well as New York’s exhibit The Japanese Village, both in 1885, exposed more Americans to Japanese wares and design. 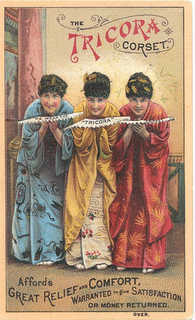 This selection of trade cards shows a wide variety of products being advertised, using Japanesque illustration and characters." in an interview with kimi kodani hill, granddaughter of chiura obata, a well-known artist from this period, she said, "Now, as you know the 1910's, 1920's, the blatant prejudice shown against the Japanese community was something that all the Japanese- American community had to deal with. And my grandparents were no exception. My grandfather, obata, had physical encounters on the streets of San Francisco because he'd be walking down the street and he'd be hit or attacked or spat upon simply because of his ethnicity. And yet ironically at the same time there was this interest in japonisme or the 'Oriental Arts,' and stores like Gump's and the City of Paris all commissioned him to decorate their Oriental rooms to sell their Asian arts." Wow! what a cool use of ephemera. I'm doing similar things with my site and found your post very interesting. Great blog. thanks for the visit and the comment, marty. isn't it interesting how "old paper" (as you call it on your blog) can come to mean so much!